The paper provides a state-of-the-art review of different conditions influencing the behavioral aspects of flexible pavement. The conditions which influence the pavement behavior are loading intensities and tyre pressure intensity, environmental conditions, surface and subsurface temperature, seepage, thickness combinations of different component layers, material properties, etc. Current pavement design and analytical procedures are discussed and questioned. The life of the road is theoretically designed for repetition of standard axle load, wherein, negligence in consideration of overloaded vehicles and high tyre inflation pressures even up to 1 MPa is noticed. 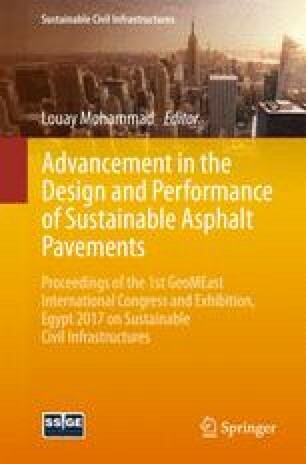 The latest developments in the design and analytical procedures of pavements are highlighted. An overview of finite element modeling efforts involving different aspects is also presented. A combined effect of various actual conditions in the field affecting the pavement performance needs to be studied in details, therefore, there is a demand for an application of analytical tool which can accommodate the details of the complex system. In this connection, it should be noted that the versatile finite element solution technique holds a bright promise. Therefore, it is proposed to discuss at length the application of the finite element method towards the design of the flexible pavements.